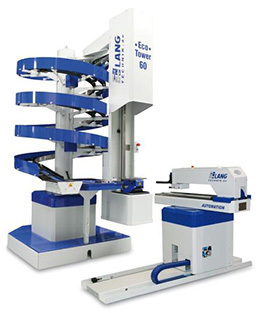 Our new Lang Eco-Tower 60 Automation System is now installed and operational. 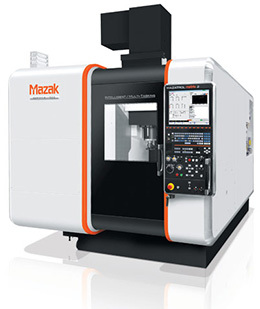 It has been interfaced with our Mazak Variaxis i-500 5 Axis Vertical Machining Centre and will allow us to run the machine unmanned to maximise its productivity, utilising the probing technologies from Renishaw that we have had fitted to the machine. The delivery and installation went smoothly as scheduled. Our thanks to Thame Engineering for a professional installation and training service. We have also taken delivery of 20 Lang Automation Vices. These have also been supplied by Thame Engineering. The automation versions of the Lang Vices come pre-equipped for the automation handling system, so they do not need to be fitted to a pallet as is required with other automation systems. The vices are designed for 5 axis work, and hold on a minimal amount of raw material, offering excellent access to the part. This is ideal for the small, complex parts that we will be making on the machine. The vices are attached to the machine via a zero point system also from Lang.